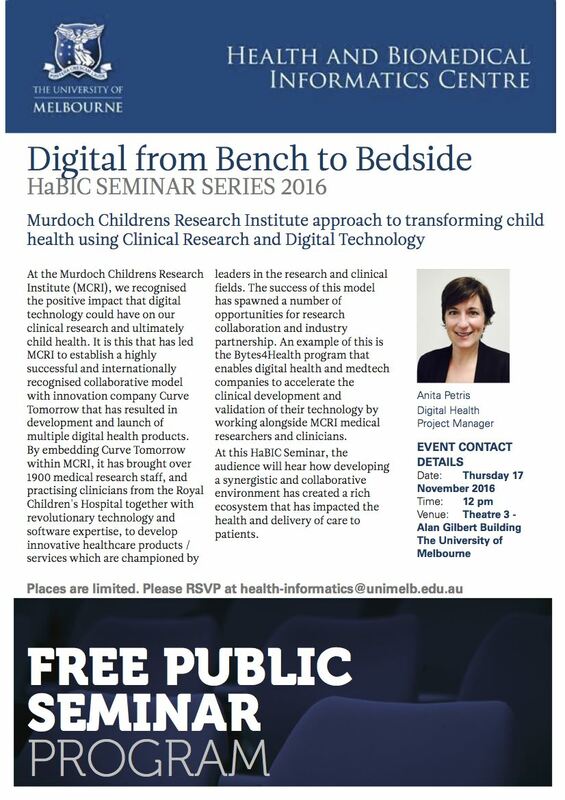 Free Public Seminar – Thursday November 17 2016 at 12 pm – Theatre 3 – Alan Gilbert Building – The University of Melbourne. The Health and Biomedical Informatics Centre (HaBIc) at the University of Melbourne. Our goal is to build collaborations that advance human health through the shared development and application of expert knowledge about information and communication technologies for healthcare and biomedical research. The unit has an interdisciplinary focus and works closely with researchers from across The University of Melbourne, particularly Institute for a Broadband Enabled Society, Computing and Information Systems, the Victorian Comprehensive Cancer Centre, The Melbourne School of Medicine and the Melbourne School of Engineering.